Here's the finished product - The lifting boom in action. This is the mechanism I can now use to hoist 'stuff' on and off Lady Jane. Especially when alongside, like now. I'm keen to point out that it is not intended to lift very heavy stuff, like the rib for example. The height of the boom above the deck means I can lift/lower stuff at any state of the tide. I know it looks like a lot of ropes and stuff to achieve a simple lift, but it all makes perfect sense. 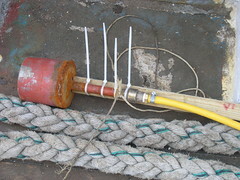 The main boom and hoist ropes with their respective pulleys are self explanatory, while the lines either side allow me to hold the boom steady either centrally or to the side. 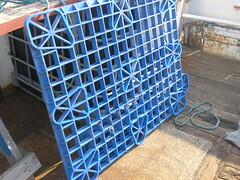 The rope below the plastic crate I made is to help pull the empty crate down to deck when the tide is out. As it happens, when I went to make myself a congratulatory cup of tea to celebrate my new creation, the gas ran out. So the first object to be hoisted for real was the empty propane bottle. Here's an unusual sight. The ground tackle and mooring buoys Lady Jane has been hanging off of these last years. This is why Lady Jane is now tucked into berth 50 in Southampton's main port, as this stuff has all been dragged up for servicing. This stuff is all so huge! The diameter of those buoys is almost my height - 1.8M (6 ft). I took more pictures than usual, so go look in my Flickr account to see more. The main reason being the next time we will see this stuff, if ever, will only be in five years time. 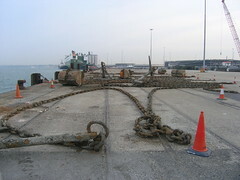 Looking at the various pictures, I'm intrigued to see the different styles of anchor used. Obviously they just used whatever heavy old anchors they could get their hands on. Particularly interesting is the bent over flukes on two of the anchors. Presumably to help prevent an unwary boat getting spiked as it goes over them at low tide. Oh yes, and to give some kind of idea of the size of chain, I used both my mobile phone and shoe to add perspective. If you were to ask me, servicing this heavy duty tackle every five years is too often. I can't see it rusting away or anything anytime soon. Still, at least the mooring buoys will be looking all shiny yellow and new when it all goes back in. This was inevitable, my faithful ol Honda generator is broken. I've had it six years now, and it's run pretty much without missing a beat, so I don't feel it owes me anything. The problem sounds simple enough to fix, the pull chord to start the generator broke (I bet Fred is pleased this happened when I tried to start the generator, and not him). 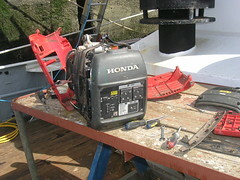 The trouble is, as I discovered, you need to virtually pull the generator apart to get to the starting mechanism. To cap it all, amongst all the ropes and things I have on board, I could not find the right size nylon chord to replace the broken one. 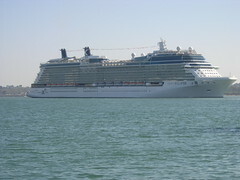 Here the Celebrity Eclipse arrives in Southampton, carrying a load of passengers from Bilbao, who were stranded because of that troublesome, unpronounceable, Icelandic volcano. Apparently the ship is brand new, so new in fact that it has not even had it's official naming ceremony yet. I bet those passengers enjoyed that journey. Something that is occupying my time right now is hoisting stuff on and off Lady Jane. Because of the effect of the tidal range on how high the quay wall is from Lady Jane, getting stuff on and off her using the ladder is not as easy as you would imagine. When the tide is in, the ladder sits almost flat while with the tide out, the ladder is at full stretch. Oh yes, and getting across when the ladder is lying flat is not dignified, to say the least. The ladder is also prone to moving about, sometimes unexpectedly, as the swell moves Lady Jane. 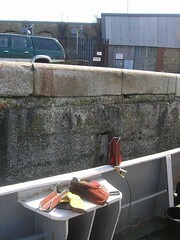 The issue is compounded with the very handy, but large, fenders which sit between Lady Jane and the quay wall. This easily adds a metre or so between the two, often more, making simply reaching across almost impossible. The cut down pallet you see, made by Fred, is the start of the base for the 'hoist basket' I'm making. Once I have the hoist working, this should mean no more balancing loads while navigating up, down or across the ladder. So this is just a bit of fun, no more. I thought that seeing I was in berth 50, which can be a bit lumpy with the ferries and big boats going by, it would be useful to harness the wave power to pump seawater to the heads header tank. Over the last few years this has become a regular, though somewhat tedious, task. Made even more necessary with more people dropping by. To be fair, Fred has made this task his own, revelling in the exercise the manual pump gives his arms. The incarnation of the wave powered pump you see is, so far, not doing it's job. I had it fastened to the side of Lady Jane, expecting the force of the waves to push water up beyond the non return valve and up to the tank. The pump also had a rubber boot on it, increasing the pipe diameter there to six inches. I suspect the wave action is a little too gentle to get the water up the pipe very far. I'm not short of things to try with this version, next on the list will be to use thinner, clear plastic, pipe, so I can see what's happening. And maybe floats on the device itself for more vigorous action. If this whole concept fails, I've other ideas to fall back on to fill that header tank. Oh yes I know I could buy something, but that's just dull. Huge grins from skipper John and his mate Chris after buzzing us on Lady Jane. John had stopped in a little earlier for coffee and digestive biscuits (cookies for you guys in the US) in his own boat. 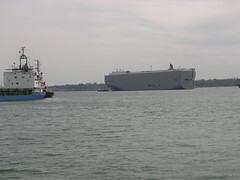 As Patch said when she was down here watching the boats "it's all go here in Southampton docks, but in slow motion". 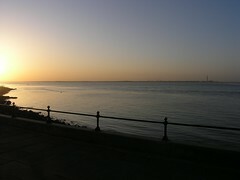 This from a lovely warm, tranquil, evening in Cowes with Patch, via the fast ferry. There is always something to do on Lady Jane, so many projects and so little time. It's this frame of mind that I've been in for some time, and so have somewhat forgotten the dream. The dream is to be able to take Lady Jane places, explore and enjoy, then move on when we are ready. This move to Southampton docks, while not everyone's idea of a dream location, reminds me it's not all work and that in the years I've been in Southampton I've not really taken any time out to explore the area, other than finding places to buy stuff. So with that in mind, and while the opportunity presents itself, it's time to live the dream somewhat. Don't worry, I'm not abandoning work on the old girl, just adjusting the balance somewhat. The only real issue with being alongside in Southampton docks so far is access onto Lady Jane. At high tide, Lady Jane's bulwarks are somewhat below the quay wall, and at low tide are a long way down. Falling is not an option here, obviously. The issue is exacerbated by a gap between the wall and Lady Jane, on account of the big fat fenders John kindly put in place to prevent the old girl being bashed against the side by the surge of water from any large boats passing, or the ferry arriving. 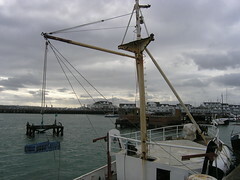 I had previously thought that the rickety old ladder I had on board would suffice, but it was never going to do the job. Here you see I've welded footings which my newly purchased, long and very expensive, ladder are now attached. At least now getting on and off Lady Jane in almost any state of the tide is much safer. With ten tenths hindsight, I would have welded these footings onto a separate plate, then bolted the plate onto the plinth you see there. That way it would be re-usable, rather than having to cut it ff once we are ready to go anywhere. The plinth could also be used for bitts, for coming alongside some place, something John is keen I do at some point anyway. Saturday night was Azura's naming ceremony. 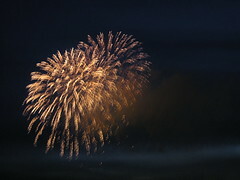 Amongst other stuff going on there was a tremendous firework display. Needless to say, I had a ringside seat to all the action. All the pictures I took were from on board Lady Jane, so all the firework pictures in my photostream have a slightly freaky, blurry look about them as my boat was moving on the water during the exposures. I must say I find myself thinking about the stacks of money involved in that all too brief spectacle, and wondering if it could have been put to better use rather than just burning it - albeit in spectacular style. I'm sure you are going to get tired of me wittering on about being in amongst all the 'big iron' in Southampton docks, but it is fun as there is stuff going on all the time. 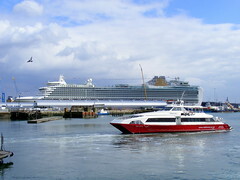 Here's a stunning picture by Hythe Eye, showing the brand new cruise ship Azura. Her naming ceremony and attendant fireworks were on Saturday. I was going to post my own picture of the Azura, but Hythe Eye's picture is all the more interesting as, if you look closely, you can see a blue and white dot just above the bow of the Red Jet Ferry there. That tiny dot is Lady Jane! I'd say the toughest part of the latest jaunt in Lady Jane was the getting going. 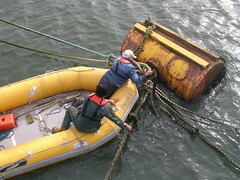 As all the vessels which were on the moorings had to go, we could not just leave our lines on the crane barge, as we had done the last few times we went places. The lines up forward were the worst, as they had been underwater and the ends ere completely covered in mussels and other slimy seaweed stuff. In the picture you see Ken wresting with the first of our stern lines, assisted by me. The picture was taken by Paul. Note the hacksaw at Ken's foot there, just in case those knots didn't come undone! This is the new view I have from one of Lady Jane's wheelhouse windows, the result of a recent move from my usual moorings in the river Itchen. A huge thanks to John, Paul, Fred and Ken for their help in crewing. I'll post more on what was a relatively quick and straightforward journey later. What has happened was the company who own the moorings are doing routine maintenance on them, which means all of us on those moorings need to be off them while they drag it all up, clean it and whatever then put it all back down again. We have been provided alternate, temporary, berthing, which happens to be right in the thick of it in the main Southampton docks. 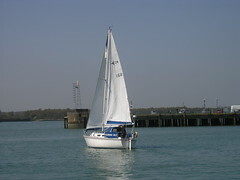 The original plan was to take Lady Jane across to Cowes, in the Isle of Wight, but unfortunately they didn't have a space available for a vessel of Lady Jane's weight. I'm already discovering that the berth can be a bit rough with the arrival of the fast ferries just next door. But on the plus side, I have a great view of all the activity in the port and am alongside so there is no need for a small boat journey every time I come and go. Great for loading and unloading stuff. The servicing should take a month, though I suspect it will be some time longer, as I'm told the tug booked to do the work has a breakdown, already delaying the job. Here we get rid of the old pair of bitts from the centre of the upper deck. The new ones are better, plus having one pair on either side makes far more sense to me anyway. For those who are interested, like the old ones you can see in the picture, the new bitts are not welded directly onto the deck, but rather onto a solid plate, which is then, in turn, welded onto the deck. This gives the whole structure much more strength. You can see the new windlass sitting crosswise on the deck there. 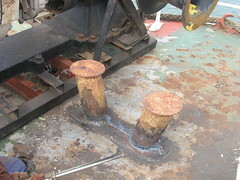 Of course all the old mountings and stuff you see below the windlass also have to go. Oh yes, and more rust busting of course.